There really is no need to say anything else about what really is the most beautiful city in the world. I have visited Paris several times, at last count I think it was 5 times. Whilst there are a zillion things to do in Paris, for me this city is all about the food. What I love about eating in Paris is the simplicity of the food. French food is elegant, simple, understated. The last time I was there I rented an apartment on the left bank, or rive gauche, in a charming local area just around the corner from Rue Mouffetard. 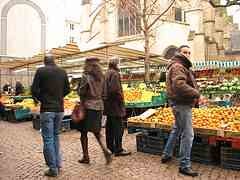 Rue Mouffetard is one of those quaint markets where locals wander down to pick up their provisions for their day. For me, it was about as close to heaven as I think I will ever get. At one end of the street was a l’huitre stall where fresh oysters were sold, buy one or buy a couple of dozen. The store owner would shuck them in front of you, ready to eat straight out of the shell or package them for you to take home. A rare photo of me in Paris … Eating! A little further along was the obligatory fromagerie (cheese shop), I should perhaps mention here that I am absolutely obsessed with good cheese, preferably with a nice glass of red. It is one of the things I miss the most living in India, and in France I am like a kid in a candy store. The pungent aroma of ripening cheese filled the air and the walls of the store are lined with cheese of different shapes, sizes and consistencies. From buttery bries to sharp blues and creamy goats cheeses. I could happily die in a fromagerie! On the street outside was a wagon with all the freshest produce from the farms, it doesn’t matter what fruit and vegetables are available, you just knew it was all fresh and well grown. Across the road was a boulangerie (bakery) selling freshly made croissants for breakfast, crusty baguettes and an array of breads all displayed in rows of baskets. Of course I can never resist pain au chocolat. Nearby is a wine shop, with wooden crates filled with local wines at bargain prices and plenty of fine wines to suit any taste. For 2 Euro I remember picking up a bottle of red wine that went perfectly well with my cheese and baguette for dinner. A small produce store sold some more niche cooking products, like a dried tomato powder that was a brilliant red with a rich tomato flavour. It was perfect just dusted on a baguette, and became a favourite on my homemade pizzas. Another was truffle salt, sprinkled on mushroom risotto, scrambled eggs or anything that needed a lift. I am told that there are other things to see in Paris, some tower, a couple of museums and a few churches… but for me all I can remember about Paris is how it tasted. Not only will you find a huge array of all kinds of items—from fish to produce to cheese—on Sundays you will also find plenty of performers singing and playing music among the hub-bub. Also, because this market is located closer to some of the traditionally more ethnically diverse neighborhoods in Paris, you will also find all manners of food here outside of the excellent and traditional traiteurs. 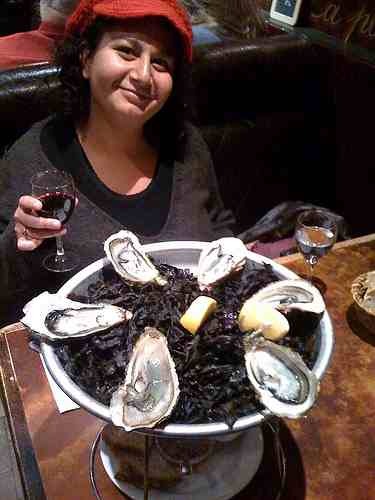 That is a GREAT photo, could go some of those oysters right now! Cheers, my cousin it took it of me. I don’t think there is a more quintessential photo of me! Paris looks amazing. It is a dream of mine to just sit in a cliched setting in a coffee shop, eating a pastry people watching! You’ve just made me very hungry all of a sudden! Have some oysters for me Terry!